Are you in search of a Marco Island condo with all of the bells and whistles but do not want the hassle of maintaining a large estate? Then Marco Island luxury condos may be the perfect option. Living in one of the most beautiful and serene places on Earth is what living on Marco Island is all about. Enjoy all Southwest Florida has to offer from your headquarters in one of our world-class condominiums. When we go shopping to find the perfect luxury condo for you, you will be amazed by the wonderful and diverse selection available. All of the condos offer a wide array of inviting amenities and endless options when it comes to taking advantage of the Florida sunshine. From the urban sophistication of living in a your luxury high-rise unit to condos on the beach or even finding a one with your own boat dock, it’s all here. Or if you are more interested in the privacy of a charming garden condo within walking distance of the beach or fabulous homes with luxurious health club facilities, Marco Island has plenty of delightful homes to choose from. The many different options of luxury condo living in Marco Island may make choosing difficult. Living here, on the other hand, with its ocean breezes, fresh salt air, delightful sunrises and sunsets, and recreational opportunities – is extremely easy! The luxury condos of Marco Island are very sound financially. This is important with the recent overhaul of loan guidelines for second homes and condos in particular. These days, the condominium get scrutinized like never before. When it comes to shopping for the best mortgage for your luxury condo, we have specialists on the island that are very experienced with processing these jumbo loans. In Collier County, because real estate values are generally higher here, a jumbo loan is any loan over $448,500, not the typical $417,000. If you're going FHA, jumbo loans start at $531,250. The thing about condo life that makes it so attractive is how easy it is. Insurance is just one example. Of course, because Marco Island is within reach of hurricanes, we have to have wind coverage here. We're in a flood zone so we need flood insurance, too. No worries. These are negotiated by the condominium and included in your maintenance fee. Coverage of your personal property, the interior of your condo and liability are handled with an HO-6 policy which is very close to your typical homeowner's insurance policy you're familiar with. See a range of all luxury condo maintenance fees in our Luxury Condo Comparison Chart. Luxury condos on Marco Island are rich with amenities. Their architectural detail is breath-taking. They have security guards and the grounds are stunning. The amenities are incredible. So, the maintenance fees reflect this. All this is true, however, in terms of percentage, they're not really bad. Even on the most expensive condos, maintenance fees top out at around $1500 per month, many are around $1000. As a percentage of condo value, this is half of some much less expensive beach condos. Owning a luxury condo on Marco Island doesn't mean you have to leave your pet in a kennel or with a relative. They all allow pets with some restrictions. Madeira allows you to have 2 dog or cats. Any condo in Cape Marco will allow a pet up to 25lbs. Riviera will allow a dog up to 40lbs. Just consult our Luxury Condo Comparison for pet restrictions on all of the condos. Of course, any condo purchase on Marco Island is an investment but, when we say "investment condo," we're usually talking about rental income. We find that relatively few luxury condo buyers go on to rent them out. The ones that do, though, capitalize on the short supply. In terms of buying and holding for capital appreciation, Marco Island luxury condos make good sense. When you consider the pricing pressure that exists on Florida real estate, it's incredible. When you add to it the finite supply of land on Marco, investing here looks like a wise play. If you need more convincing, just consider the fact that Marriott is currently investing a quarter of a billion dollars in expansion and upgrades to their property. They couldn't do that without exhaustive demographic studies and projections. I think the case for Marco Island's future is plain. While the vast majority of our luxury condos on Marco Island are located on the beach, we have a few notable buildings that are not. The condos located on the south end of the island, on Caxambas Pass, are considered "Gulf" condos. There is really no beach to speak of on the south end, especially at high tide. The benefit of these condos to many is the view. Looking out at the Ten Thousand Islands is captivating. The wild life that pass your condo here is amazing. Dolphins regularly cruise the south channel. Pelicans can be observed diving for breakfast and dinner here every day. Besides the Gulf condos, we have luxury boat condos as well. The Esplanade and Pier 81 are absolutely plush bases of operation for your fishing and boating adventures. Everyone on the island heads to the Esplanade for dinner or ice cream once in a while. Not only is it home to great condos, it offers a lifestyle like nothing else on the island. Within the Esplanade are a bank, several restaurants, a coffee shop, art galleries and, of course, the marina. It's a lifestyle. Luxury condos are located in many buildings on Marco Beach. We've just highlighted the most prominent ones here. You'll also find luxury condos in Summit House, Mirage, Princess del Mar, Prince, Duchess and others, too. The Boyle Team are luxury condo specialists and have sold many condos in Madeira, Cape Marco and Hideaway Beach Club. 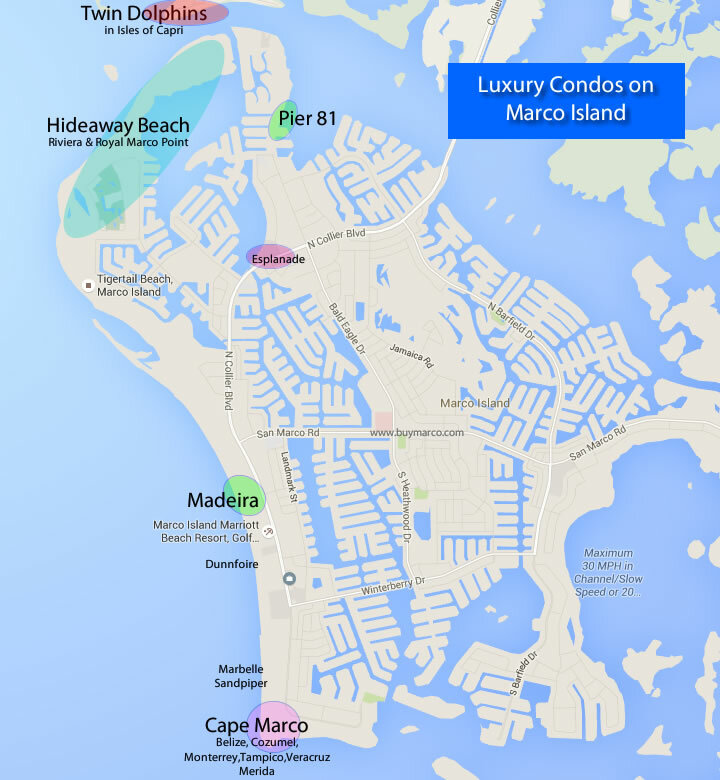 Contact us for a complete education on the merits of any luxury property on Marco Island. Hideaway Beach Club is the most unique of Marco Island's luxury developments. It not only has a country club and executive golf course, but the beach there is only accessible to Hideaway residents. Cape Marco, located on the south end of the beach, contains six condominiums. Three are on the beach and three face the Gulf to the south. Got a big boat? The Esplanade and Pier 81 will allow you immediate access to your boat located steps from you luxury condo. Some of the most spectacular views in the area are in Isles of Capri. Twin Dolphins is the pinnacle. See all of the current listings here. Hideaway Beach Club has its own beach and is a favorite gated community on Marco Island. Riviera is the centerpiece of the Royal Marco Point high-rise luxury condos. The Esplanade and Pier 81 represent pure luxury and they have marinas for your boat. The Esplanade is home to fine dining and shopping, as well. Pier 81 is just a couple of minutes to the Gulf of Mexico. 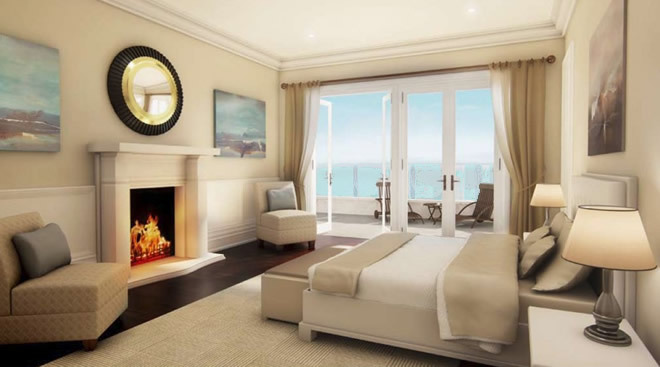 The newest luxury condo on the beach is nothing short of perfection. Madeira is located adjacent to the JW Marriott Resort, right in the middle of Marco Beach. The Marriott invested $250,000,000 in their resort in 2015-2016. Cape Marco is located at the south end of Marco Beach. The six buildings in this super-luxury gated community are some of the most detailed and special in Florida. Belize and Cozumel occupy the tip. Tampico and Veracruz are beachfront. Monterrey and Merida face the Gulf and Caxambas Pass to the south. Need a little help? No worries! Just drop us a note in the form below and we'll take care of everything.